Benjamin "Ben" Horch: conductor and music teacher; born 19 November 1907 in the village of Freidorf, South Russia, to Eduard and Katharina (Eszlinger) Horch. He was the second of six children in the family. Ben married Esther Hiebert on 29 June 1932. The couple had one daughter, Viola, who died in 1968. He suffered a series of strokes and died on 2 July 1992 in Winnipeg. Only two years after his birth in the Lutheran village of Freidorf in South Russia, Benjamin Horch and his family moved to Canada. The family settled in Winnipeg, Manitoba, where Ben attended a private school held in a Lutheran church before moving to a public school in the city. When he was 19 years old, he was baptized and joined the North End Mennonite Brethren Church, where he soon became the choir leader. In 1930, he took conducting courses before taking a job as a music teacher at the Winkler Bible School. From 1932 to 1938, he worked as the choir director and music instructor at the Winnipeg Bible College (now Providence College). He studied at the Bible Institute of Los Angeles (now Biola University) from 1939 to 1942 before returning to Winnipeg to teach at the Mennonite Brethren Bible College, where he worked from 1944-1955 with a break in 1951 for studies in ethnomusicology in Detmold, Germany. During the summers, Ben visited many churches across Canada, giving workshops on music and conducting choral festivals. In the 1940s, he founded and became the first conductor of the Mennonite Symphony Orchestra, later renamed the Mennonite Community Orchestra. Meanwhile, Ben married Esther Hiebert, daughter of C. N. Hiebert and Katharina (Harms) Hiebert, on 29 June 1932 at the North End Church in Winnipeg. The couple had one daughter, Viola, who was killed in an accident in 1968. In 1955, Ben and his family moved back to California, where Ben taught briefly at Immanuel Academy before obtaining work at a local radio station. 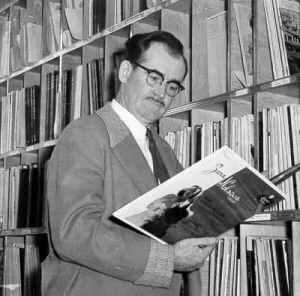 On his return to Canada in 1957, he worked at the CFAM radio station in Altona, Manitoba, for two years before moving to Winnipeg to produce a music program with the Canadian Broadcasting Corporation, where he worked until his retirement in 1973. In 1974, he received an honorary doctorate from the University of Winnipeg. After his retirement, Horch commissioned various musical compositions, including the Mennonite Piano Concerto by Victor Davies, and he also wrote articles on various musical subjects for several publications. In 1987, he was recognized for his achievements in media and communications with the Prix Manitoba Award. In 1992, Ben suffered a series of minor strokes and was hospitalized near the end of June. He died on 2 July 1992, and the funeral was held four days later on 6 July 1992 at the First Mennonite Church in Winnipeg. Benjamin Horch was a dedicated musician whose love of his heritage and appreciation for choral and instrumental music inspired many people in the church and the wider community. With his commitment to his career and to helping others achieve their musical goals, he had a profound influence on his family, the church, and the community around him. Berg, Wesley. From Russia With Music. Winnipeg, MB: Hyperion, 1985. Canadian Conference of Mennonite Brethren Churches. “Horch, Benjamin and Esther Hiebert Horch.” Web. 14 April 2010. http://www.mbconf.ca/index.cfm?pageID=312. The Canadian Encyclopedia. “Horch, Benjamin.” Web. 14 April 2010. http://www.thecanadianencyclopedia.com/index.cfm?PgNm=TCE&Params=U1ARTU0001647. "Choral Conductor and Educator Dies at the Age of 84." Mennonite Reporter 22 (3 August 1992): 3. Epp, Frank H. Mennonites in Canada, 1920-1940: A People's Struggle for Survival. Toronto, ON: Macmillan, 1982: 462. Klassen, Peter. "The Many Contributions of Ben and Esther Horch." Mennonite Brethren Historical Society Newsletter 3 (1982): 1-4. Letkemann, Peter. The Ben Horch Story. Winnipeg, Manitoba: Old Oak Publishing, 2007. Mennonite Brethren Herald (11 September 1992): 27. Die Mennonitische Rundschau (16 September 1992): 27. Siemens, Lloyd. "Ben Horch: Dean of Mennonite Conductors." Mennonite Mirror 4 (October 1974): 12-14; (November 1974): 9-10. Huebert, Susan. "Horch, Ben (1907-1992)." Global Anabaptist Mennonite Encyclopedia Online. April 2010. Web. 22 Apr 2019. http://gameo.org/index.php?title=Horch,_Ben_(1907-1992)&oldid=142767. Huebert, Susan. (April 2010). Horch, Ben (1907-1992). Global Anabaptist Mennonite Encyclopedia Online. Retrieved 22 April 2019, from http://gameo.org/index.php?title=Horch,_Ben_(1907-1992)&oldid=142767.